For their second concert in the third series of 5 at the First, Rachel Mercer playing cello and Angela Parkon piano shared a concert of “Contrasts: Alone and Together”. The evening began with Mercer playing Johann Sebastian Bach’s very familiar series of six Suites for solo cello known as Suite No 1 in G major. This is a very intimate piece of music which perfectly suited the venue. The H.P.O. 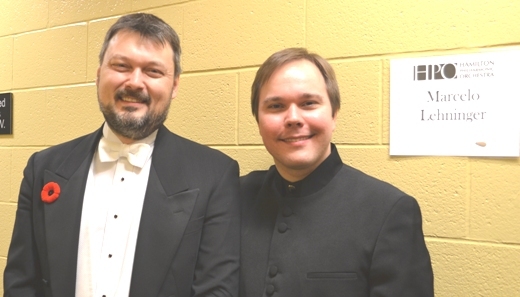 concert was named & dedicated to its two composers, Maurice Ravel and Dmitri Shostakovich. Approximately one generation apart, the Frenchman and the Russian had some similar and yet some totally diverse musical styles and experiences. Ravel lived from the end of the 19th century to almost the start of WWII. His compositions like Tombeau de Couperin; Daphnis e Chloe, plus his arrangement of Mussorgsky’s ‘Pictures’ are now almost as familiar as the piece he wrote for the movie “10” (just kidding)! Saturday evening, the Oakville Chamber Orchestra presented a program which their conductor, Charles Demuynck, called Brilliance and Light. It contained the Triple Concerto in C major by Beethoven and Symphony #41 in C major; ‘the Jupiter’, by Mozart. The Triple Concerto is unique in that it is the only classical concerto ever written for a trio of soloists. Amy Dorfman, piano; Carolyn Hubel, violin; and cellist Felix Wong are the Blakemore Triofrom Nashville, Tennessee and they played the trio parts brilliantly & with perfect timing. Hubel, Dorfman & Wong – the “BLAKEMORE Trio” with the O.C.O.